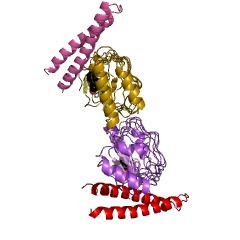 HR1 was first described as a three times repeated homology region of the N-terminal non-catalytic part of protein kinase PRK1(PKN) [(PUBMED:7851406)]. 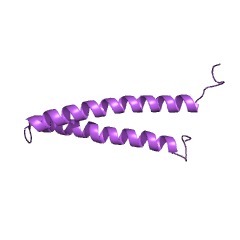 The first two of these repeats were later shown to bind the small G protein rho [(PUBMED:8647255), (PUBMED:9446575)] known to activate PKN in its GTP-bound form. 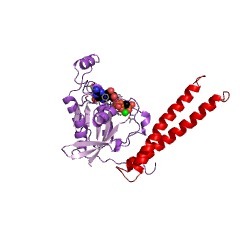 Similar rho-binding domains also occur in a number of other protein kinases and in the rho-binding proteins rhophilin and rhotekin. 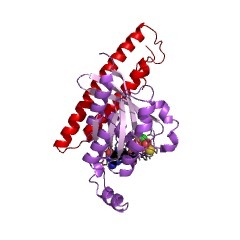 Recently, the structure of the N-terminal HR1 repeat complexed with RhoA has been determined by X-ray crystallography [(PUBMED:10619026)]. It forms an antiparallel coiled-coil fold termed an ACC finger. There are 6745 Hr1 domains in 3157 proteins in SMART's nrdb database. Taxonomic distribution of proteins containing Hr1 domain. This tree includes only several representative species. The complete taxonomic breakdown of all proteins with Hr1 domain is also avaliable. Click on the protein counts, or double click on taxonomic names to display all proteins containing Hr1 domain in the selected taxonomic class. This information is based on mapping of SMART genomic protein database to KEGG orthologous groups. Percentage points are related to the number of proteins with Hr1 domain which could be assigned to a KEGG orthologous group, and not all proteins containing Hr1 domain. Please note that proteins can be included in multiple pathways, ie. the numbers above will not always add up to 100%.